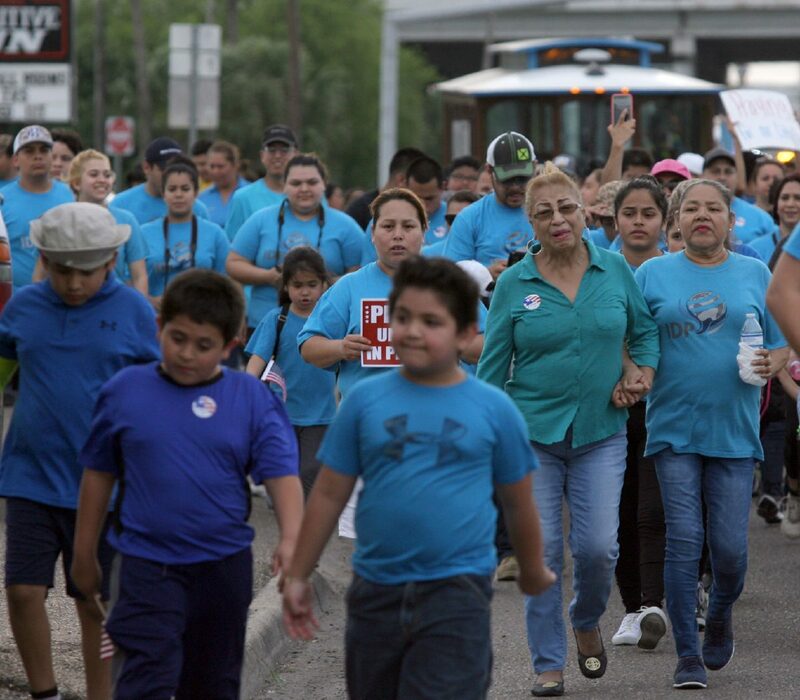 Members of the Centro Familiar Cristiano Igelsia del Pueblo of Las Milpas join the march in the Walk of Faith in Pharr Thursday, May 03, 2018. The group of marchers joined other communities throughout the nation for the 2018 National Day of Prayer. PHARR — Community members proclaimed their faith through simple prayers and music Thursday as the city marked the 2018 National Day of Prayer. Held on the first Thursday of May, the annual observance invites people of all faiths to pray for the nation. The observance was created in 1952 by President Harry S. Truman and Congress. 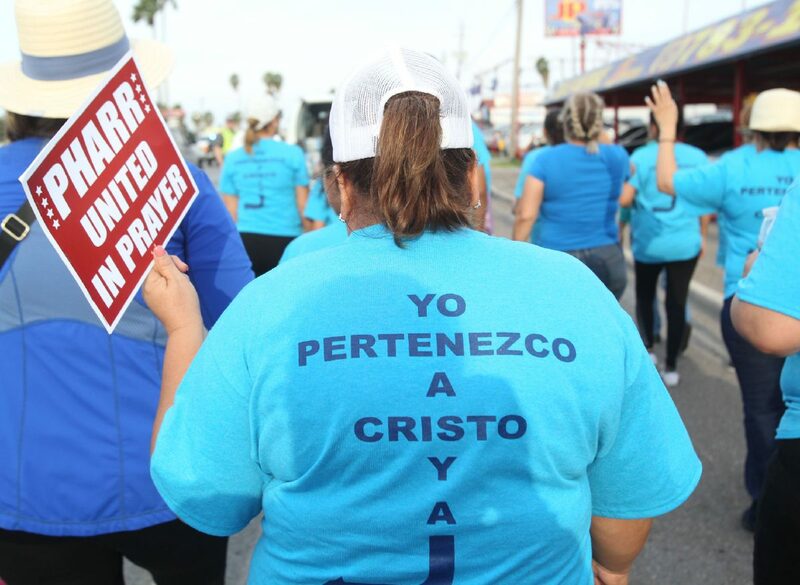 Rebecca Arizmendi, president for the Greater Pharr Chamber of Commerce, said this year the city and chamber decided to dedicate the day and do something different than the usual lunch hour of prayer. 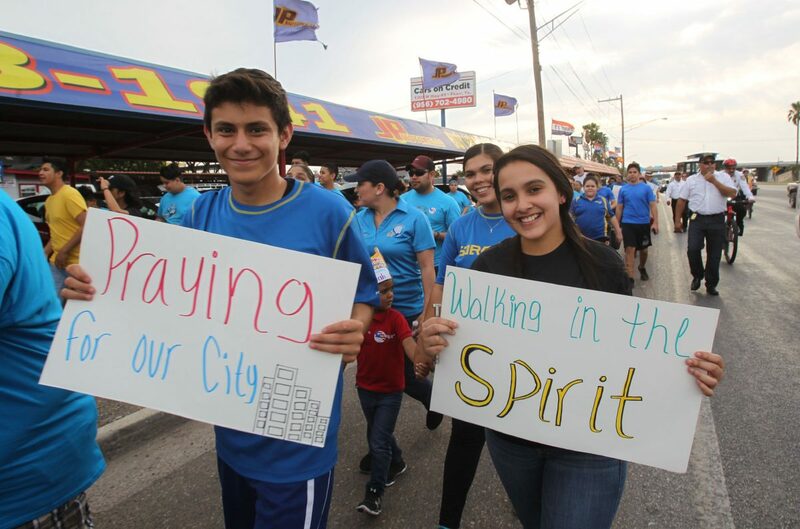 Jacob Torres,16 and Karen Leon,14, participate in the Walk of Faith in Pharr Thursday, May 03, 2018. The group of marchers joined other communities throughout the nation for the 2018 National Day of Prayer. 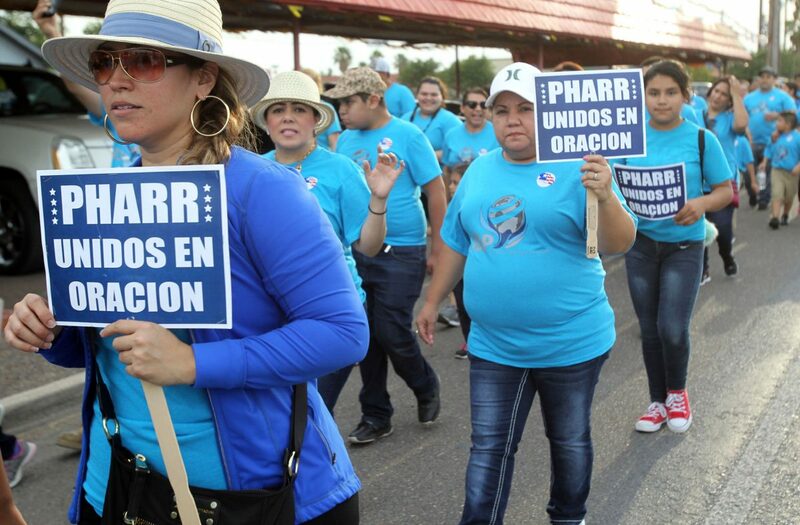 Gloria Martinez, participates in the Walk of Faith in Pharr Thursday, May 03, 2018. The group of marchers joined other communities throughout the nation for the 2018 National Day of Prayer. “We decided to do an afternoon of prayer in the hopes of seeing how the community would want to come out,” Arizmendi said. The city held various prayer sessions in which the community could participate. The events began with a private prayer luncheon at noon with elected officials, members of the religious community, representatives of the local business community and invited guests. The afternoon activities at the Pharr Events Center included a women’s hour of prayer and a business hour of prayer before ending with an education hour. “We really tried to be inclusive and diverse to really get the theme of unity here in the city,” she added. At the entrance of the center stood a large board with the wording “Pray for America – Prayer Petition Board.” On the board, individuals could leave prayer notes and wishes, which included messages about hospital stays, health issues or just asking for peace. Mayor Dr. Ambrosio Hernandez delivered remarks through a recorded video, which was played throughout the day and asked participants to come together, joining hands and hearts in solidarity to unite the community and nation in prayer. Students from the Pharr-San Juan-Alamo North High School Fellowship of Christian Athletes gave a prayer during the education hour in which they recognized the school board and sought blessings for students and businesses in the community. Maricela Y. Pérez, development officer for the St. Philip Neri Oratory Schools in Pharr, urged that the prayers continue throughout the year. The day wrapped up with a community walk of faith through the city’s streets, beginning in the parking lot of Jackson Palmer Crossing and ending at the Parks and Recreation building. About 40 community members, including church members from Centro Familiar Cristiano Iglesia Del Pueblo, carried signs and sang Spanish hymns.